48 hours before the match at Leicester, Jose Mourinho publicly questioned his players state of mind and criticised their mentality. Whether his comments were genuine, or an attempt to psychologically galvanise the team after three successive draws, remains a mystery. Whatever Jose's intentions were, the team made a mockery of those, perhaps legitimate concerns, at the King Power Stadium. The champions are in turmoil and a shadow of their former "in your face" counter-attacking selves that created last season's fairytale, but United certainly responded emphatically to any talk of potential shortcomings. Jose surprisingly started in a 4-4-2 system but quickly reverted to his favoured 4-2-3-1 formation and moved Henrikh Mkhitaryan inside after 20 minutes. The change instantly improved the visitors attacking strength as the pace of the Armenian and Marcus Rashford from wide - coupled with the string-pulling creativity of Juan Mata - stretched Leicester's defence and pinned them back. Eric Bailly kept Jamie Vardy quiet on his first appearance of 2017 and the Ander Herrera - Paul Pogba midfield axis thoroughly dominated opposite numbers Danny Drinkwater and Wilf Ndidi. 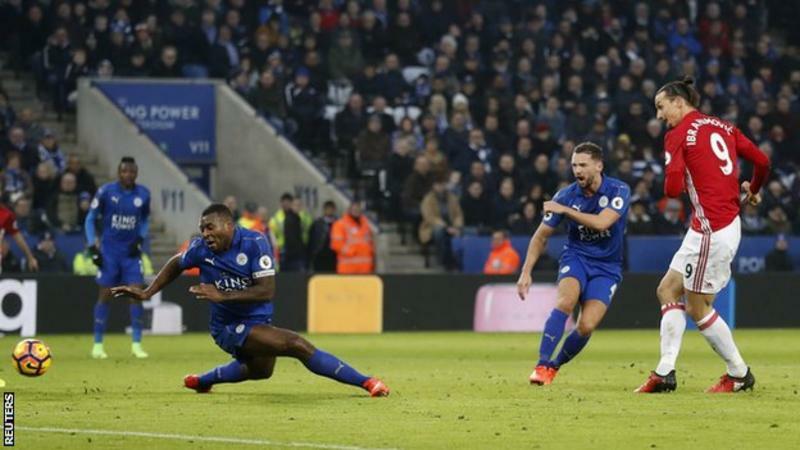 The win at Leicester ensured the Reds extended their unbeaten league run to 15 games, a sequence that stretches back to October and that chastening reverse at Stamford Bridge. There will be stiffer tests to come than that of a free-falling Foxes side, but a return to winning ways and three different goalscorers will surely leave Jose and the team confident of a top four finish. For the first time in what seems like ages, the Reds finally, FINALLY capitalised on the timely slip ups of our faltering rivals. Liverpool remain winless in the league in 2017 after a 2-0 defeat at Hull - their fourth defeat in five games - while Arsenal's annual stumble continued apace with a 3-1 reverse at runaway leaders Chelsea. This all means that United's 3-0 win has left the Reds of North London and Merseyside glancing nervously over their shoulders. The battle for Champions League qualification looks to be going to the wire ahead of the Old Trafford visit of Watford on Saturday. United now sit a solitary point behind Jurgen Klopp's side - who host Spurs next - and two off of fourth placed Arsenal, who welcome rejuvenated Hull on Saturday.